Want a polished test in no time? Here it is! Looking for some refreshing test questions after 5 years of using the same test? Look no more! 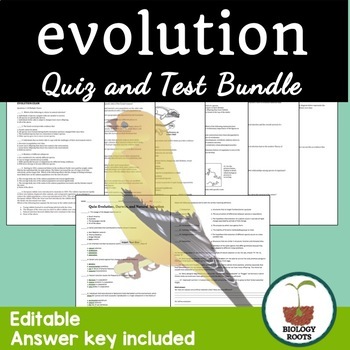 This contains an evolution quiz that is composed of 6 multiple choice questions, 6 matching, 4 true or false and 3 short answer. It is completely editable as a MS Word doc. Also included is a test is composed of 19 multiple choice questions and 7 short answers. Also editable.